FAQ #1: Why are there Ten Points of Wellness™ and not 3 or 5? Aren’t 10 a bit much? Originally there were three: Structure, chemistry, and the mind. These three were based off the “Triangle of Health”. 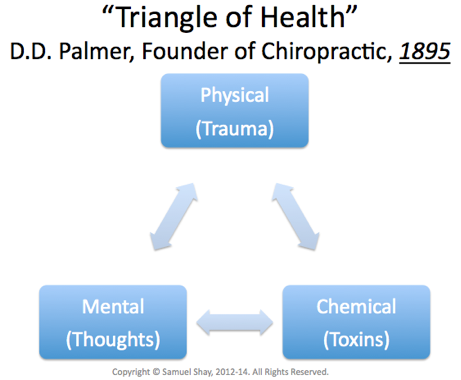 The Triangle of health was cognized by the founder of Chiropractic, D.D. Palmer, back in 1895. The three legs were described as the physical, chemical, and mental. The Triangle of Health had a reverse known as The Triangle of Disease, consisting of the 3 “Ts” of disease: Trauma, Toxins, and Thoughts (stressful thoughts). The triangle models worked well in 1895 because life was simpler back then. For example, the food was almost all organic by default, most people were farmers and spent their time outside in the sun doing physical work, families were usually in closer proximity to each other (grandparents, parents, and grandchildren lived together or near each other), people slept more because there wasn’t much artificial light yet, there was no mass communication, cars, internet, or other complexities. However, that simple 3-legged model is over 100 years old and the world today is exponentially more complex with more stress, toxins, sedentary lifestyle, less sleep, strange infections, less time, and so on. This 3-legged paradigm had to be expanded without becoming overwhelming. 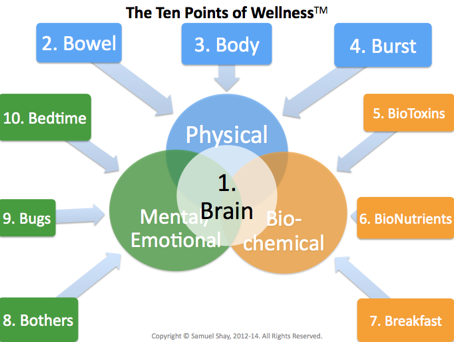 I developed the Ten Points of Wellness™ as the natural expansion of the Triangle of Health to account for the complexities of modern times and modern discoveries in neuroscience. However, anyone can make up a new model for health, but not everyone tests their new model on real patients suffering with really tough issues. These ten points were tested in my clinic on chronically ill patients, and what I found was that 100% of all chronically patients had a minimum of 7 out 10 of these points way off point. The 7 out of 10 discovery explained why these chronically ill patients constantly struggled with their health despite bouncing from one product, protocol, and/or practitioner to the next. Why? Most products, protocols, and practitioners only deal with 1-3 points, maybe 5, but almost never all 10. So these chronically ill patients would get marginal, temporary, or no results because not all the major issues were addressed, only some. These patients needed all Ten Points of Wellness™ assessed and treated consistently at the same time for a period of time. Below is an infographic explaining this new model, followed by a brief summary of each point. First, the triangle was changed into intersecting spheres instead of the rigid bars of a triangle. These intersecting spheres (physical, biochemical, mental/emotional) much more accurately reflect the complexity and interweaving nature of health and physiology instead of just rigid lines. Each sphere was then spliced into their 3 critical sub-components. The brain was then put as the centerpiece of all health. 1. Brain / Synapse: “Brain” was put as the centerpiece of health, as all aspects of health are regulated, modulated, or routed through the brain. The ‘synapse’ is a scientific term for two pieces of neurology connecting together. Modern neuroscience has progressed tremendously in the past 120 years since the inception of the Triangle of Health. I give the brain central location, with all other spheres ’synapsing’ into the middle. 2. Bowel / Stool: “Bowel” includes every way your body excretes toxins, including defecation, urination, exhalation, sweating, exhaling, etc. Some of you reading this may chuckle when reading about “Bowel” but consider this: Would you live in a house where you can’t flush the toilet properly? How long would you live in a house that got more toxic and fetid with each day? You wouldn’t live in a fetid house, so why would you let your body become fetid? If you don’t regularly defecate, than feces sit in your colon and leaches back into your bloodstream, affecting your body, biochemistry, brain, and mind. 3. Body / Structure: “Body” includes all aspects of the physical body, including joints, muscles, skin, circulation, lymphatic system, digestive organs, skull and sense organs, the spine, and posture. It includes all aspects of physical damage as well, such as scar tissue, misaligned joints, blockages, degeneration, tears, and other issues. All other spheres of health will suffer if the physical body is damaged because damaged tissue releases inflammatory chemicals into the whole system and also sends noxious (stressful) nerve signals to the brain, putting the brain on fight-or-flight mode, altering your biochemistry and mood. 4. Burst exercise / Speed training: “Burst” includes all aspects of exercise, especially High Intensity Interval Training (HIIT), known as Burst training, as well as walking, flexibility, agility, and mobility. “Burst” also covers exercise goes wrong, such as how to avoid injuries from particular exercises, why jogging damages your hormone systems, and how a sedentary lifestyle (not moving) harms your brain, biochemistry, body, and mind. 5. BioToxins / Synthetics: “BioToxins” includes all things chemically toxic to the human body, including, but not limited to: heavy metals, genetically modified foods, trans-fatty acids, industrial chemicals, synthetic colorings and flavorings, pesticides and insecticides, toxic makeup, fast foods, drugs, allergens, and artificial sweeteners. You must know how to identify, avoid, or at least minimize exposure to such toxins. 6. BioNutrients / Sustenance: “BioNutrients” includes all beneficial nutrients that our bodies and brains require for optimal health, including, but not limited to: essential fatty acids, vitamins, minerals, glyconutrients, sunlight, water, protein, anti-oxidants, probiotics, and enzymes. Most people do not take in enough quantity or enough variety of BioNutrients. 7. Breakfast / Starting meal: “Breakfast” includes when and what you eat at the start of the day, and also includes your morning routine and general rhythm of the day. All my patients with chronic disease had one of the four types of bad breakfasts: 1) skipping breakfast altogether, 2) coffee for breakfast, 3) sugar for breakfast, or 4) glorified sugar for breakfast. The bad breakfast pattern was so common, I made breakfast a separate category under BioChemistry. In fact, I wrote my first visual eGuidebook, “Magnificent Morning Metabolism” specifically to cover why breakfast is so critical to health, including how to easily implement a great breakfast every day. Only 3 chronically ill patients ever had a consistent, nutritious, and full breakfast in my career. However, they had at least 7 other points of the Ten Points of Wellness™ way off point. These 3 patients were consistent with my observation that 100% of my chronically ill patients had a minimum of 7 out of 10 points way off point, though their seven did not include a bad breakfast. 8. Bothers / Stress: “Bothers” includes all facets of stress that harm our health and quality of life. The types of stress include, but are not limited to: Mental, emotional, financial, relational, sexual, intellectual, occupational, cultural, religious, spiritual, and family stress. As you can tell, this is a huge topic, and some would argue the most important topic of all. 9. Bugs / Symbiosis: “Bugs” includes all aspects of your relationships to microscopic organisms, including your beneficial gut bacteria, chronic infections, acute infections, and handling exposure to external sources of pathogens, such as mold and bacteria. If your gut bacteria is imbalanced or you’re dealing with a chronic exposure to mold, then your health can be seriously compromised. Many people don’t realize that if your gut bacteria are imbalanced, your brain and biochemistry will suffer tremendously because your immune system will begin to misbehave. 10. Bedtime / Sleep: “Bedtime” includes the all-important and least appreciated aspect of health…your sleep. If you don’t sleep well, then your health will suffer, as will your mind, body, and biochemistry. Summary: Back in 1895, a 3-legged paradigm was sufficient. However, in the 21st century there is too much complexity to fit into a simple 3-legged model. Ten Points of Wellness™ built on the Triangle of Health to incorporate all major facets of health, including modern neuroscience, without getting too complex.